In January this year, Snapeal.com became the first Indian e-commerce site to start selling vehicles online in partnership with Auto manufacturers. Mahindra & Mahindra was the first company to come on-board. While the idea of buying vehicles online may sound outrageous to a few, Snapdeal has been quite successful with it. Though we do not have confirmed reports, M&M seem to have sold quite a few two-wheelers online. Seeing this success, HERO seems to have jumped the online fray as well. They have partnered with Snapdeal.com and have started selling their electric two wheelers. What’s more, as an introductory launch, they are offering some great discounts as well. It is interesting that HERO has listed only their electric bikes and not their regular line of bikes. This is probably because HERO sees Snapdeal as a much better channel to push their eco-friendly electric bikes rather than traditional high-end sport bikes that they have. 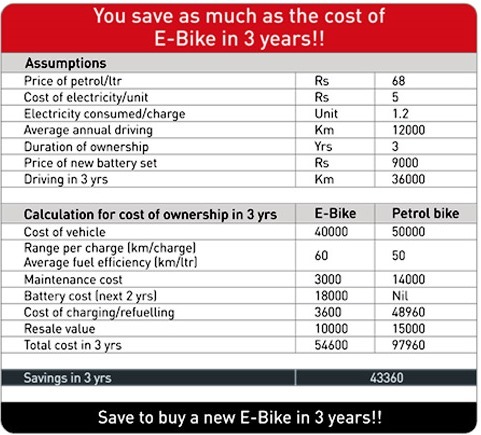 Online buyers are probably the best-fit customers who understand concept of electric bikes. If you are in the market for buying a two-wheeler, you should definitely look at buying a electric scooter. The cost of ownership works out nearly half compared to similarly featured Petrol vehicle. But there are even more advantages if you buy electric scooter online from Snapdeal. The first and the biggest is – it works out much cheaper and there is no hassle involved. Also, currently along with the regular discount, you are additionally getting 10 percent extra discount from snapdeal. So a HERO electric scooter with a retail price of around Rs. 36100 will end up costing only Rs. 32490. 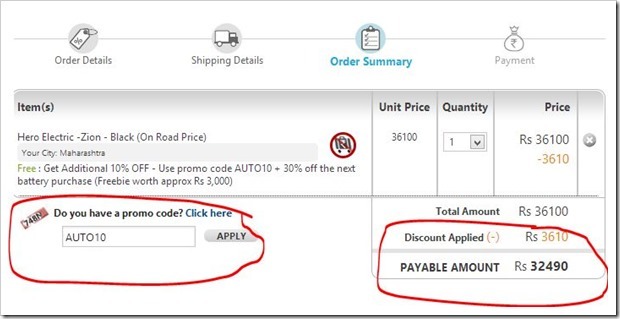 (see below) This is On Road Price, which includes all taxes + registration. Once you order from Snapdeal.com, a company executive will visit your home to finish the paperwork and formalities. Within a week, vehicle will be delivered at the door-step of the customer. Its that easy! So, if you are in the market, look at HERO electric scooter option quite seriously. You cannot go wrong with it!